Ipswich Town manager Mick McCarthy says he has "no doubt" on-loan winger Ainsley Maitland-Niles will become an Arsenal first-teamer in the future. The 17-year-old, who has made three substitute appearances for the Gunners, took the corner for David McGoldrick's winner against Burnley on Tuesday. "Wow. The talent of him; I think he's going to play for Arsenal, there's no doubt in my mind," McCarthy told BBC Radio Suffolk. 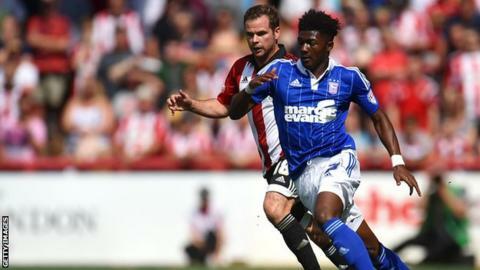 Maitland-Niles, who is on a season-long loan at Portman Road, has started all three of Town's Championship matches this term, helping McCarthy's side pick up seven points. And the Ipswich boss revealed he had been keeping tabs on the England Under-18s international for some time. "Nobody knew anything about him. I watched him play against Reading for [Arsenal's] under-21s last season and I thought he was great. "I enquired about him in January, but they needed him for their Champions League squad," he said.